In this image made from video provided by Chris Rogers, surfer Koa Smith rides a wave off the coast of Namibia, on the Western shore of Africa. Smith rode for nearly a mile over a 120-second span and stayed upright as he traveled through eight barrels -- the hollow formed by the curve of the wave as it breaks over the surfer's head. 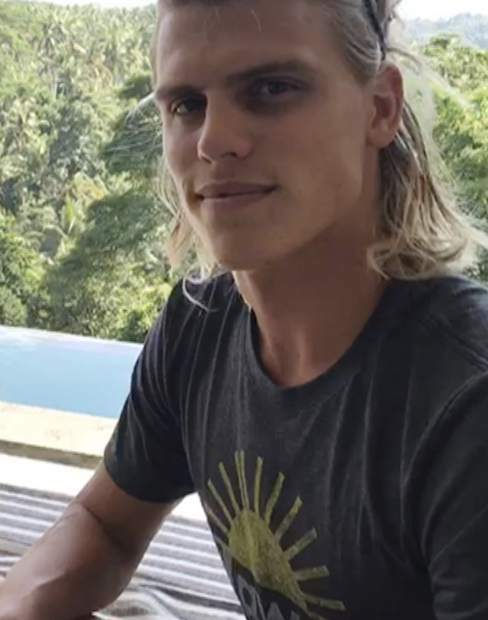 Koa Smith is seen on Monday while in Bali, Indonesia in a screenshot from a video where he talks about his two-minute journey on a surfboard off the coast of Africa. Smith rode a wave for nearly a mile and stayed upright as he traveled through eight barrels--the hollow formed by the curve of the wave as it breaks over the surfer's head. To say Koa Smith was at the right place at the right time is perfectly accurate. To say he got lucky — that’s missing the point. Perched precariously on his surfboard, the 23-year-old from Hawaii rode a wave off the coast of Namibia, on the western shore of Africa, for 120 straight seconds. He stayed upright for nearly a mile as he traveled through an unheard-of eight barrels — the hollow formed by the curve of the wave as it breaks over the rider’s head. Almost as amazing — Smith and videographer Chris Rogers filmed the entire ride using both a drone that hovered overhead, and a GoPro attached to a mouthpiece that Smith wore while he rode. “I’d like to think that everything I’ve done my whole life led up to that moment,” Smith said of his masterpiece over a one-of-a-kind wave last month, the likes of which has never been documented before. Smith owes his success to being every bit as much a calculated scientist as a devil-may-care risk-taker. Much like a meteorologist tracks storms several days before they hit, Smith and many world-class surfers have mastered the art of reading weather charts to predict when and where the greatest sized ocean swells will hit. It’s one thing to know they’re coming, quite another to get to where the action is, and Smith is more than willing to drop everything in search of the perfect wave. “He can be in one place one day, and you call him and he says, ‘I’m taking off for Africa tomorrow,’” says Smith’s publicist, Ryan Runke. The locale of his greatest triumph is called Skeleton Bay — a mystic stretch of beach fronting the South Atlantic on the western coast of Africa. Don’t bother trying to go unless you know someone who knows the area. It’s a two-day plane ride from Hawaii, followed by a car ride through the desert, culminating with a journey down a stretch of sandy, unmarked roads that lead to the ocean. The final stop is at a stretch of beach where a lucky handful of surfers share space with hundreds of aggressive seal colonies, thousands of jackals and, once in the water, the occasional great white shark. Smith grew up on Kauai and said he got into surfing the way many Hawaii kids do. Smith qualified for 10-and-under nationals when he was 6; he had his first Nike contract by age 12. Though surfing has been around much longer than its distant action-sports cousin of snowboarding, athletes in the ocean sport are now faced with some of the same questions the snowboarders dealt with 20 years ago. Surfing is making its debut at the Olympics in 2020 and there figures to be a divide between those who want to keep it as a lifestyle sport — chasing waves and footage — and those who see a more lucrative path on a competitive side, which, in surfing’s case, already has a well-established history. “If you compete, you have to be really good at riding bad waves,” he says. In a way though, he’s won his gold medal. That day on Skeleton Bay will live on, both in his mind and on the video, for a long time.